Uses: Corporate, Manufacturing / Warehouse Colors: Browns/Tan/Beige Lengths: 13 panel 24'-1" Heights: 6'-0"
In a factory, it is always important to provide a safety barrier for maintenance workers as they repair machinery. 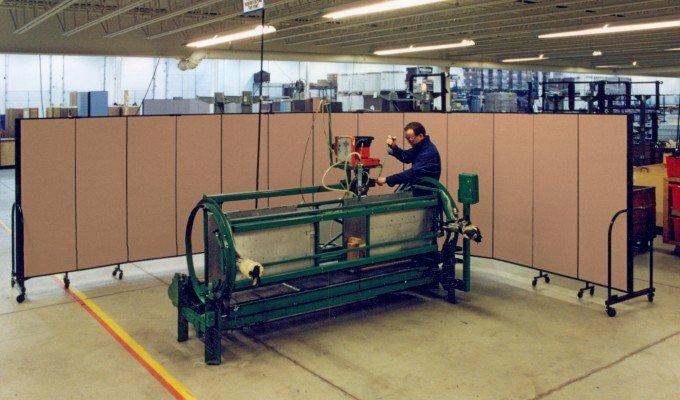 Here, a company utilizes a folding portable wall to create a barrier during machine repair to prevent distractions to other workers as well as to prevent debris from leaving the space. Safety first!